Maximum eclipse is of duration 4m 7s at 10:11:18 UT at location 23.14°N 16.75°E. For those wishing to see to consecutive total solar eclipses from the same spot on Earth, this eclipse and the total eclipse of 1 August 2008 cross in Russia just north of Mongolia. Click here to see the crossing point. Interestingly this eclipse crosses the track of the 11 August 1999 total solar eclipse. Click here to see the crossing point. Also note that the previous annular eclipse of 3 October 2005 crosses the track of this total solar eclipse. Click here to see the crossing point. Ten saroses later in this series (16 July 2186) gives the longest total eclipse (7m 29s) for over 10,000 years. Eclipse-Reisen.de is a German travel agency offering tours to solar eclipses and other astronomical events. 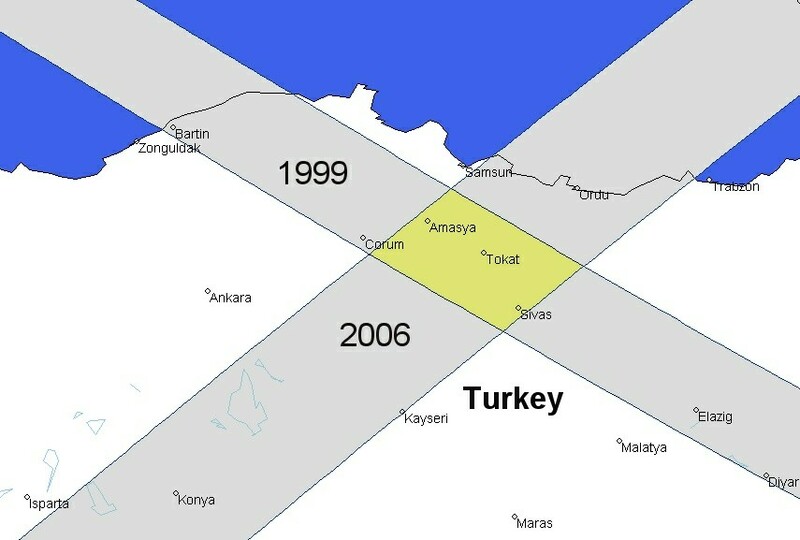 We have other 20 different tours to Turkey, Libya, Egypt, and Niger to observe the TSE 2006, e.g. a 3 1/2 day-trip to Libya departing from Vienna for less than € 800.-. Also we are the German booking office for Performanz Travel, a company already mentioned in your list. Our focus is on Germany, Austria, and Switzerland but clients from other countries are also welcome. Winco Eclipse Tours Inc trips to Egypt. Land tour may be taken from anywhere by flying to/from Cairo. All inclusive trip via JFK also available. Providing Turkey Tour itineraries and make all travel arrangements what you need in Turkey. Omega Holidays plc: White Cross, Lancaster, LA1 4XQ. 01524 37500 a two day break to southern Turkey.